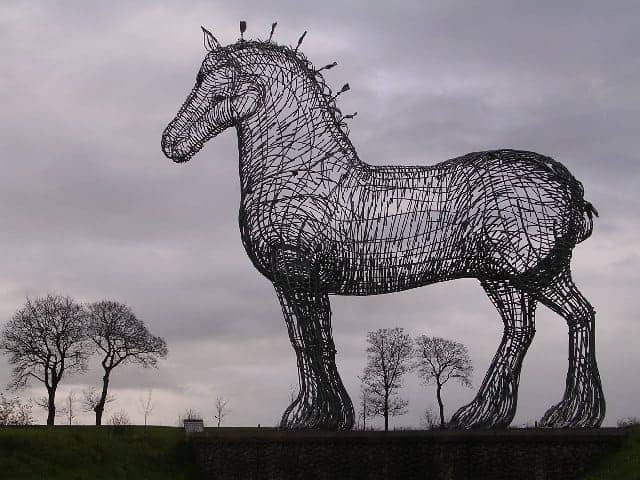 Andy Scott's breakthrough wirework sculpture of a Clydesdale, Heavy Horse is crafted from galvanised steel. Positioned near junction 9 of the M8 motorway at Easterhouse, Glasgow, it is seen by an estimated 100,000 motorway users every day, that's hundreds of millions of viewings since it was unveiled in 1997. The 4.5 metre tall horse has become an iconic landmark for Glaswegians returning to their home city.